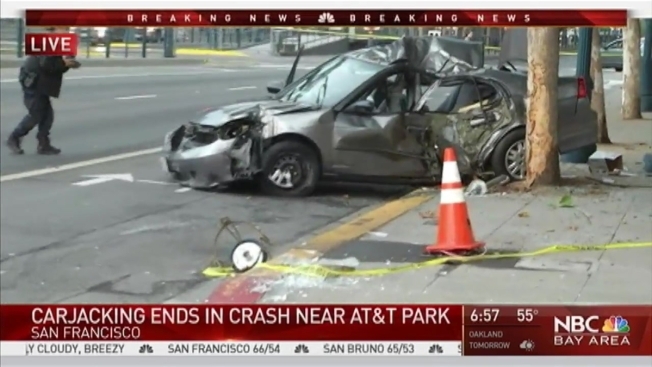 San Francisco police arrested three people early Wednesday morning after a carjacking and chase that ended with a crash near AT&T Park. Officer Carlos Manfredi said the carjacking was reported at 3:24 a.m. in the 6000 block of Geary Boulevard in the Richmond District. A man had been smoking a cigarette in his car near Clement Street near 24th Avenue when one of the suspects approached him, with a backpack and a gun, police said. The victim ran away and three suspects got in the car, police said. Officers soon found the car, but the suspects didn’t stop when asked to by police, Manfredi said. The car crashed into a light pole and parking meter on Second and King streets, close to the baseball stadium. Two people were arrested inside, but a third suspect ran away. After a short chase, the third person was taken into custody as well, Manfredi said. All three suspects were taken to the hospital and will be taken to jail pending charges, Manfredi said.